Have you ever been asked to describe your day in a nutshell? You need to summarize what happened in just a few words. 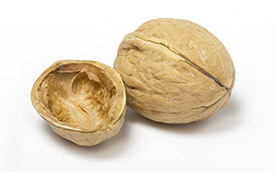 The phrase in a nutshell dates back to 77 AD, when a Roman philosopher claimed that the epic poem The Iliad could fit on a parchment small enough to go inside a walnut shell. This, of course, was an exaggeration, but the idea stuck. In school, you can use "nutshelling" to quickly summarize things you've learned during class, in a lesson, or for an assignment. A nutshell is a kind of summary. In one sentence, you write the most important idea or part of a topic. You can write nutshell summaries in your notebook or learning log during class or after important lessons. On July 4, 1776, the delegates of the 2nd Constitutional Congress signed a document that declared America's independence from Great Britain. A plane crash leaves a boy stranded in a vast wilderness, where he must learn to survive on his own. The challenge is boiling down the most important parts of the topic in just a few words. One way to do so is to try to answer as many of the 5 W's and H questions as you can in a single sentence. Your Turn Try out these nutshelling activities. In one sentence, summarize the best thing that happened to you this week. In one sentence, summarize the most important idea you heard in your last class. In one sentence, summarize something you read recently. In one sentence, summarize your favorite movie. In one sentence, summarize this minilesson. Summarizing Ideas in a Nutshell by Thoughtful Learning is licensed under a Creative Commons Attribution-NonCommercial-ShareAlike 4.0 International License. Based on a work at k12.thoughtfullearning.com/minilesson/summarizing-ideas-nutshell.